Standing in the middle of a vineyard in Huailai County, Hebei Province, a two-hour drive northwest of Beijing, one could think they were in France or Italy. There are endless rows of vines, whose grapes were recently harvested for this year’s vintages. The fresh air, crisp breeze and dry soil are the ideal elements to grow grapes that are processed to make such well-known Chinese wines as Great Wall, Dynasty and Dragon Seal. While the tradition of making wine from grapes dates back some 4,000 years, the industry has only begun to flourish in the past 20 years. Other than Hebei Province, other wineries can be found in such areas as Qingdao city in Shandong and Zhejiang provinces, and Xinjiang Autonomous Region. Haulai’s Sino-French Chateau, is a joint venture between France and China that began 10 years ago. Then premier-to-be Wen Jiabao visited the wine country and declared there should be a vineyard near Beijing. 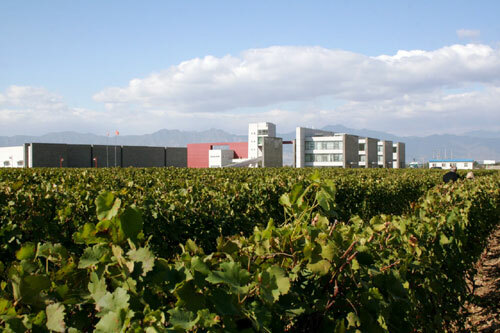 The contract was signed between the two countries two years later and Huailai was chosen for its good climate, temperature and soil for growing grapes. It also interestingly shares the same latitude with Bordeaux.